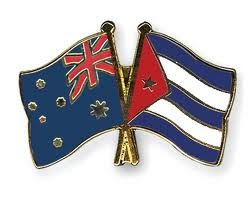 ACFS Sydney aims to promote and encourage friendship, understanding, trade and other exchange between the people of Australia and Cuba. We organise a variety of political and cultural events during the year, culminating in the annual Work/Study Brigade to Cuba. An ACFS priority is to end the US blockade of Cuba. The ACFS meets at 6:30pm on the first Thursday of every month (except January) at the NSW Teachers' Federation building, Level 1, 33 Mary Street, Surry Hills. Meetings are open to all friends of Cuba and those interested in finding out more about Cuba. Ten days ago I returned to Australia after my son and I spent four weeks in Cuba travelling from Habana down to Baracoa. Before we left friends and acquaintances warned us to take great care in such a country. What we found was not only completely different from such expectations, but the experience of being in this country, of meeting so many people who opened their houses and their hearts to us so freely, and of witnessing first hand the devastation that the USA Embargo has had on this country, completely changed us. The view I formed as I left this beautiful country and hospitable people is that not only should the USA lift the Embargo unconditionally, but also that it and other countries that played their role in their attempts to destroy Cuba should financially compensate it for its losses. I was moved that I was there to witness a people of a country who are willing to hold their heads up high and be proud that they stuck to their beliefs despite the mighty arms of many Goliaths falling heavily on their heads and the heads of their children. No one ever mentions that the large majority of the Cubans you speak to there say that they wish to maintain the political system they have and that they should have the right to do so. Correct me if I am wrong, but no Cuban has ever gone to another country and killed anyone, terrorised anyone, robbed anyone, or forced anyone to do anything against their will. In Cuba we were privileged to be permitted to share the homes and food of the people we stayed with. The people I am talking about are people who hugged us with tears in their eyes as we left their homes and continued on our journey. They are people who invariably kept phoning the house we were going to next to ensure that we arrived safely. We saw a country where one rarely sees a policeman except where large crowds gather to watch a baseball game. Unlike when travelling in other countries we were never robbed, despite the fact the we were at times careless. And Yes, we did have fun with these naturally happy people. We loved their culture. We loved the restaurant where rhythmic music never stops and you are compelled to stop eating and tap your fingers to the magical sounds. But Yes, this country changed us. And what changed us was to experience first hand for a short period of time the injustices that this tiny island has had to endure. As a result of being there in Cuba, my son decided that he was not going to return to Australia. He remained in Mexico to do voluntary work, and from there he will go to other needy countries offering his services free of charge. As for me I returned back to Australia keen to again put my hands on the keys of my grand piano. But when I opened the lid of my piano the extreme moral dilemmas that dwelled in my mind while I was in Cuba suddenly rose like sceptres before my eyes. I looked at my grand piano and realized that the price of my piano alone was equal to what 7500 Cubans earn in one month. I shall be struggling with this dilemma for a long time and sleep sleepless nights as I remember a country and its people that has be brought to its knees economically by those who are much more powerful and by those who persist in telling Cuba that it has to be free. My son and I told many of the friends we now have there that we will see them again next year, as we will both be made godparents of a baby that is soon to be born to one of the mothers we met. Next month, I will be visiting Cuba with my family and with my two super cute kids. Because of that I want to ensure about my safe and Legal travel to Cuba. Do you know where can I get the help?